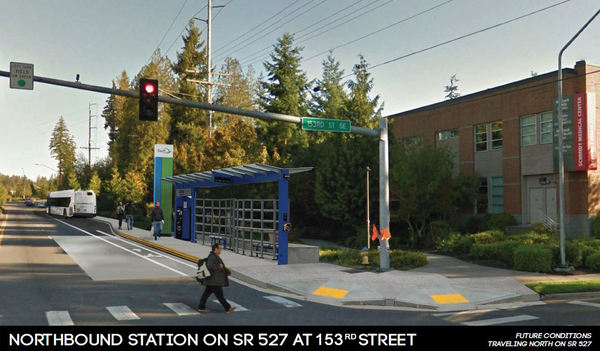 An artist's depiction of what the Swift Green Line station on northbound Bothell-Everett Hwy. and 153rd St. SE will look like when complete. The weekend construction work that was scheduled for April 13-16 was postponed due to inclement weather. The April 20 edition of Swift Network News will have updated information. Construction crews continue to move south down Bothell-Everett Hwy. Construction is underway this week at 153rd St. SE. A single northbound lane will be closed from 8 p.m. to 4 a.m. most nights this week and next week as construction crews begin stormwater and drainage work at the future Swift Green Line station. Several stations in Area 2, from Gibson Rd. to 16th Ave., will experience periodic single-lane closures as crews pour concrete for station footings, curbs and sidewalks. The closures will only occur between 9 a.m. and 2 p.m. The only nighttime work (8 p.m. to 4 a.m.) in Area 2 is scheduled for Wednesday night at eastbound 128th St. and Dumas Rd. Stations in Area 1 are entering the next phase of construction as crews return to these sites to begin to install the actual station structures. Periodic daytime (9 a.m. to 2 p.m.) or nighttime (8 p.m. to 4 a.m.) single-lane closures can be expected while crews erect the pillars for the station canopy. 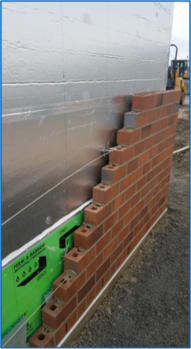 Masonry brick is beginning to cover the site’s future mechanical building with an attractive exterior. The entire installation is expected to take a few weeks. Later this week, crews will pour concrete for the future transit center’s driveways and bus platforms. Paving the entire site will take several weeks, and will sometimes require a concrete truck every 10-15 minutes! Crews are installing wireless internet and emergency vehicle detection devices on the new traffic signals this week. The work requires periodic single-lane closures on both directions of 75th St. between the hours of 9 a.m. and 2 p.m. When the weather is dry, crews will begin pouring concrete to rebuild driveways for businesses on 75th St. east of PUD. 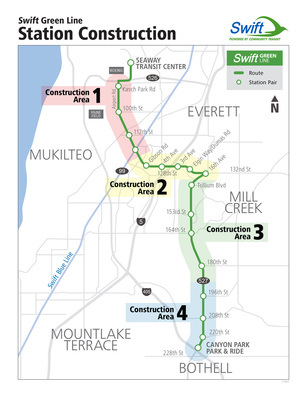 Community Transit Live returns to a 30-minute length for its next live webcast, focusing once again on Swift Green Line construction updates. Tune in on Tuesday, April 24 at 4 p.m.
Agency staff will provide construction updates and answer any questions regarding the Swift Green Line. 1) Register at www.crowdcast.io/e/CTLiveApr24/register. Registration requires only an email address (don’t worry, we won’t share it) and allows you to view the visuals that accompany the broadcast. 2) Visit our Facebook page during the webcast. It’s easy and requires no registration, but you will not be able to see the visuals that accompany the conversation. If you cannot attend the live webcast, a recording with subtitles will be posted within two business days, both on Facebook and on our website. More details and recordings of previous webcasts are available at www.communitytransit.org/ctlive. The installation of traffic signs and lighting over the eastbound lanes has been delayed for an unspecified length of time. Construction will continue as weather permits on a sidewalk, curb and gutter along westbound 128th St. from 3rd Ave. to the Shell station. The west driveway of Quality Inn & Suites will be closed so crews can access the area. Restoration of the rain garden on the northwest corner of 128th St. and 3rd Ave. continues this week as crews add soil to support the native growth.